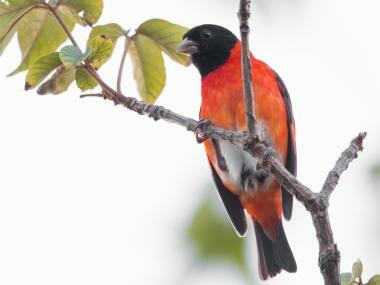 In Venezuela, the red siskin (Spinus cucullatus), a vibrantly colored red-and-black finch, is inextricably linked with the country’s identity. It is present in poems, paintings, names of streets and sports teams and even graces the back of the 100,000 Bolivar bill, but it is rare in its natural habitat. To help reverse this, the Smithsonian and the Piedra de Cachimbo coffee farmers in northern Venezuela stepped in. With support from the Neotropical Migratory Bird Conservation Act, farmers are committing to the conservation of 400 hectares of forest for traditional shade-grown organic coffee, seeking Smithsonian Bird Friendly certification of their beans. This approach is part of the Red Siskin Initiative (RSI), an international consortium in which the Smithsonian collaborates closely with Provita, a local NGO focused on the preservation of biodiversity in Venezuela, and other partners.